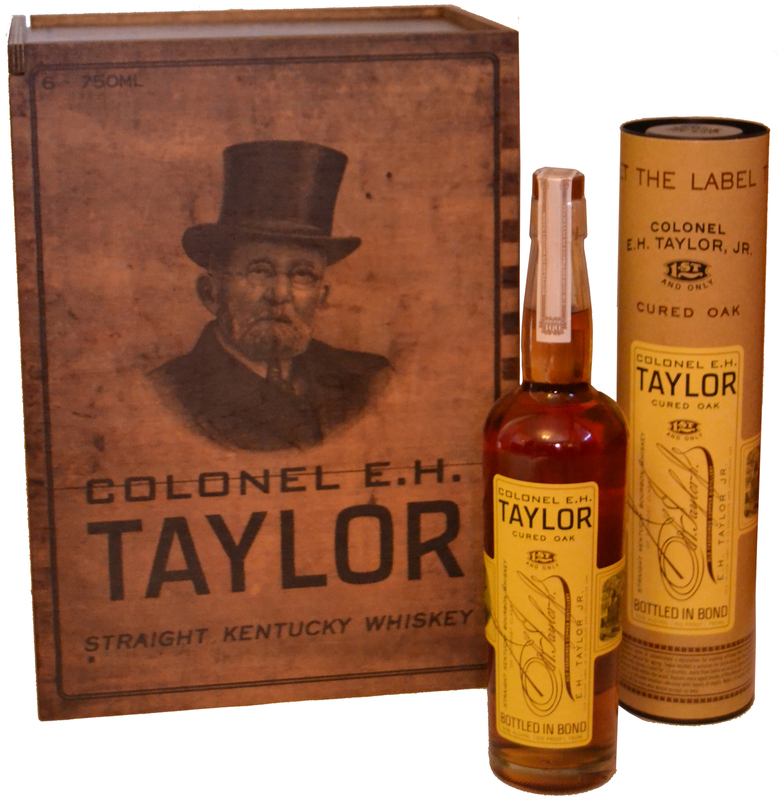 After a flood of Col. E.H. Taylor whiskeys hit the market in 2011-12, the release schedule suddenly went quiet. I’d thought brand owners Buffalo Trace had forgotten about it, but at last here we go with a new expression: Col. E.H. Taylor Cured Oak. This 100 proof, Bottled-In-Bond, small batch bourbon was aged in Taylor’s warehouse “C” at Buffalo Trace Distillery. The barrel staves used for this special release were allowed to dry outside in the open air for 13 months, more than twice as long as standard barrel staves. Most white oak barrel staves used for Buffalo Trace’s bourbons are placed outside for 6 months before being fashioned into whiskey barrels. Collaborating with barrel manufacturer Independent Stave Company back in 1998, this extra aging curing process allowed the wood to dry even longer, eventually allowing the whiskey to extract more rich and complex flavors deep within the oak. After crafting and filling these unique barrels, they were then aged inside of Taylor’s iconic brick and limestone warehouse “C,” built in 1881 … for seventeen years. Now, Buffalo Trace does regular experiments with longer wood curing for its staves — half the whiskeys in the Single Oak Project use wood that is cured for 12 months instead of the typical 6 — but, fair enough, this isn’t the norm. The E.H. Taylor Cured Oak bottling offers lots of fruit on the nose, surprising for a whiskey that, remember, is 17 years in barrel — making it, by far, the oldest E.H. Taylor ever released. Red apple, some cherry, and mint hit the nostrils… all preludes for an engaging and impressively complex body. Lighter than you’d think given the 100 proof alcohol level, it pushes more of that fruit on the palate, laced with vanilla and a bit of lumberyard, before settling into a sultry, dark cocoa note. Beautiful balance, moderate but lush finish. Taylor Cured Oak goes down much too quickly, and my sample vanished well before I was finished exploring its charms. That said, this is likely a whiskey that is likely defined more by its advanced age than the extra few months the lumber spent in the sun before they turned it into barrels. But that’s just my analysis. No matter. My advice: If you see it, buy it without hesitation. This is obviously the left overs from the BTEC extended stave drying experiment. In that review you only gave it a B+. Do you think it was the extra couple of years that really helped it or maybe just the way these barrels blended together compared to those released in the BTEC? Tough to say, even if that’s true. This is also 100 proof vs. 90 for the experimental, which isn’t insignificant. Cask selection, as you indicate, is one of the most important parts of any whiskey, though, so that alone could drive the improvement. The state of Virginia received 90 bottles of this, according to multiple sources at Virginia ABC. Amazed that I was able to some. Got one in southern Illinois. Wesker – Not in Champaign. Much further south, but it is the only one the store got. Good luck in your quest. Looking for a bottle of this to celebrate the birth of my daughter :) ….wiling to pay $150 for anyone who can spare me a bottle. Please email me at [email protected] I’m active duty military here at Ft. Bragg, NC so if anyone hears of some around NC please let me know. Thanks all, cheers! Just cracked a bottle of this stuff. I’m not as experienced as some, but I do enjoy a premium beverage. My take: first hit is the toffee. No, more like caramel. Very smooth for 50%. Next comes the vanilla finish. both these flavors are dominant. After a few sips, I started to get the fruit. First, something dark — black currant maybe or even blackberry. Then, maybe a touch of strawberry. Didn’t get much oak. The caramel and vanilla really dominate. I have had 40% whiskeys with far more bite than this one has. I’ve yet to get a Pappy’s, but I do have an Old Rip Van Winkle and I’d put this head and shoulders above that for pure smoothness and intensity of flavor. Definitely one of Buffalo Trace’s finest. The Mecklenburg County ABC here in Charlotte just had an email lottery for EHT Oak and EHT Single Barrel. They said their allotment was gone in under 5 minutes. Hey guys, I have an extra bottle I wouldn’t mind parting with. If you are interested email me [email protected].